This website, maintained by Matt Heavner, presents the research dealing with the middle and upper atmospheric optical and electrical phenomena conducted at the Geophysical Institute of the University of Alaska Fairbanks. Students can find an introduction to sprites and jets, discover the hardships associated with viewing the phenomena, and view short videos of the events. Researchers can learn how the group is attempting to determine how sprites and jets affect the terrestrial electrical environment. 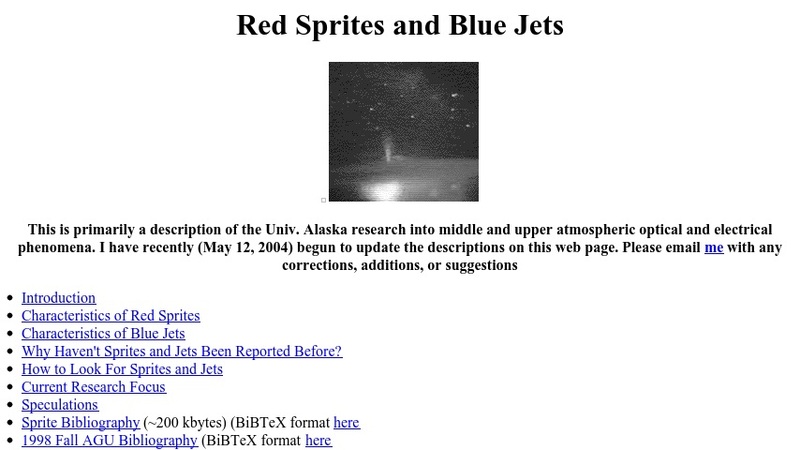 The web ite provides links to other groups observing sprites and downloads to dissertations describing aspects of sprites research.